The Chapman School of Seamanship offers the STCW Standards for Training, Certification & Watchkeeping endorsements described here to enable mariners to move from deck hand to deck officer. BST - Basic Training (5 days) - This course covers the four modules required for this Coast Guard approved endorsement. 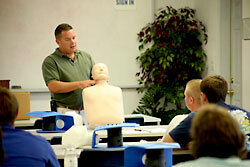 These modules include Personal Safety and Social Responsibilities, Personal Survival Techniques, Elementary First Aid, and Basic Marine Firefighting. Firefighting will be held at Port Canaveral Maritime Academy. BST - Basic Training Renewal (3 days) - This 3 day renewal course satisfies those requirements set forth by the USCG. 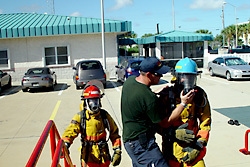 The four modules include Personal Safety and Social Responsibilities, Personal Survival Techniques, Elementary First Aid, and Basic Marine Firefighting. Firefighting will be held at Port Canaveral Maritime Academy. Advanced Firefighting (5 days) - This course consists of classroom lectures, instructor demonstrations and hands-on training for those subjects related to shipboard firefighting. Students will learn: Fire chemistry and classification, Prevention, Use of portable extinguishers, breathing apparatus, protective clothing and foam application, Search and rescue, Confined space, open deck and multilevel firefighting, Effects on ship stability, Team training, ICS, Shore-based firefighting coordination, and Dealing with hazardous materials. Students spend a good part of their time fighting basic and complex live fires on board a land based vessel. This course meets STCW-95 requirements for both lower and upper level licenses. MROP - Marine Radio Operators Permit (1 day) - This course confers the authority to operate licensed radio stations in the aviation, marine and international fixed Public Radio Services. MROP consists of a 3 hour preparation course, 1 hour F.C.C. Exam & License Application. MSA - Maritime Security Awareness (1 day) - Provides knowledge for crew members working at port facilities & on vessels. Includes the meaning & requirements for the different security levels; emergency procedures & contingency plans; recognition & detection of weapons, dangerous substances and devices; non-discriminatory recognition of the characteristics & behavioral patterns of persons likely to threaten security; and the techniques used to circumvent security measures. The successful student must have solid English and math skills. In addition, the student must be 18 years of age, (have basic swimming skills for BST) and be in good health. Students must have an official photo ID on the first day of class. The Registration Form must be completed and signed (by a parent or guardian if the applicant is younger than 18) and returned to the Chapman School along with the non-refundable deposit. Advanced Firefighting has both a non-refundable deposit and a non-refundable tuition balance. Tuition does not include housing, board, or transportation (except where noted above). The Chapman School accepts Discover, Visa, MasterCard or American Express. Campus housing consists of dormitory apartments. Each unit contains a bedroom, convertible living room/bedroom, bath, kitchenette and a covered porch. The number of students per unit during this program is generally a maximum of two. All units are air-conditioned, fully furnished and equipped with refrigerator, counter top range and cooking utensils. Housing is offered on a space available basis. The School is not responsible for the loss of any personal property. Sorry, no pets. Housing fee is due 10 days prior to the start of class to reserve accommodations.